The NIST fire simulation is not consistent with the photographic evidence. The fire on floor 12 is critical to the NIST hypothesis because the collapse of floor 13 in the north east corner of the building is supposedly the beginning of the initiating event that led to the implosion of WTC 7. On page 383 of NIST NCSTAR 1-9 volume 1, the fire simulation graphic of floor 12 shows the fire conveniently burning around column 79 and then coming back to it at 5:00 p.m. The NIST fire simulation is not consistent with the photographs of the fire. The photographs show, and the NIST Appendix L report states, the fire on floor 12 had burned out by 4:45 p.m. In fact, it had burned out in the east end before 4:00 p.m. Therefore, the fire did not cause floor 13 to collapse at 5:20 p.m. and the implosion of WTC 7 did not occur as NIST has proposed. 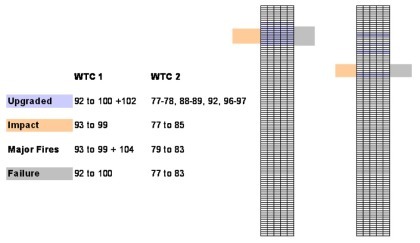 Below is a link to a composite graphic that compares the NIST graphic with a more realistic representation of the progression of the fires on floor 12. A professional version of this graphic will be published soon. Is the NIST hypothesis supported by evidence? With the supposed upcoming release of NIST's draft report on WTC 7's collapse, I thought it would be useful to revisit NIST's original report for WTC 1 and 2. As many of you know, NIST found that the towers collapsed from aircraft damage and fire alone and that they found no corroborating evidence for alternate theories of the collapse. What I find interesting is that the same can be said for NIST's own hypothesis - namely that no corroborating evidence was found to support its fire theory. 1) Aircraft impact cause damage to the North face and several core columns were severed. Aircraft debris also dislodged fireproofing that helped speed the later collapse. 2) The jet fuel ignited a large fire that originally started on the north side of the tower and over the course of 90 min worked its way to the south side. 3) The fire temperatures seen were in excess of 800C in some places, causing weakening of the core but specifically causing the long span floor truss assemblies to sag.